Lamp oil. Oil lamps are a good alternate use for rancid oils. They are easy to make and put out about the same amount of light as a candle. Having a selection of oil lamps is a very good prep and lamp oil, like this brand, isn’t too expensive. Furniture Conditioner and Polishing Agent. Cooking oils can makes a great wood furniture polish and conditioner. I have used it on butcher block in the past. Combine equal parts oil with vinegar for an amazing mixture that can make old, scratched furniture look almost new. Olive oil softens and preserves leather. You can also use it on leather to help restore suppleness, and protect the leather. Get paint off your hands. Rub some oil into your skin, let it sink in for 5 minutes, and then wash thoroughly with soap. Protect rattan and wicker furniture. It helps keep rattan and wicker furniture from cracking. Just gently rub some warm oil into the furniture with a soft cloth. Making soap. Rancid oils can be used to make lye soaps. This book is a classic for basic soapmaking information and instructions. This would be a good skill to have for TEOTWAWKI. Animal feed. Dogs and cats do not appear to be bothered by rancid oils. Add a little to their food and it will improve their coats. Making Diesel. Old cooking oils can be processed and burned in diesel engines. These are the alternate uses for rancid cooking oil that I came up with after a few minutes of thought. I am sure there are many more. Every now and then, somebody I know wants to get rid of old cooking oils. I tell them to mark it as not fit for human consumption and keep it. It may come in handy someday. 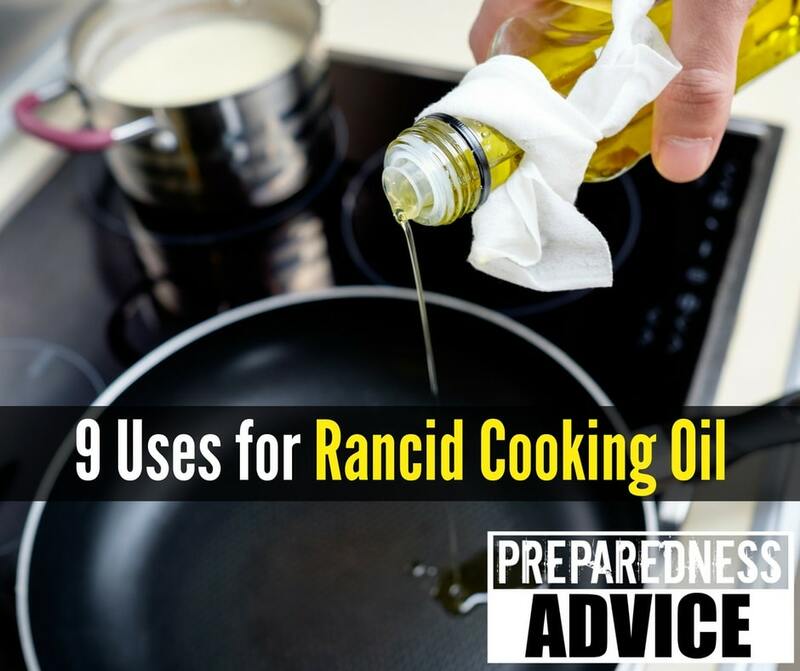 If you’re wondering why it’s not a good idea to eat rancid oil, read this. Try to find multiple uses for everything you store. How is your Land Navigation? This entry was posted in food storage, survival and tagged diesel, Food, fuel, furniture, lamps, oil, tools. Bookmark the permalink. THANKS ALWAYS HOWARD, AS USUAL , GOOD ARTICLE. AS FAR AS MAKING DIESEL, I’LL TAKE ALL YOUR OLD BOTTLES OF COOKING OIL AND ADD IT TO MY TANK. THANKS OLD FRIEND. Since we don’t know where you live, can you please tell us what sort of business could use it in our area? If you are looking to acquire rancid oils, a restaurant is a good source. Olive oil and peanut oil can be used to soften and preserve leather. Corn oil, canola oil, and linseed oil should never be used on leather. They will dry hard and make the leather brittle. They do make a good sealant or paint base for use on wood, especially if thinned with a little turpentine. Olive oil, alone or mixed with glycerin, is an excellent skin conditioner. Most oils mixed with borax make a very effective rat poison. Oil on stale bread can be used to bait live traps. For those who cast theur own bullets and reload their own ammunition, particularly for antique black powder cartridge rifles and revolvers, a 1:3 mixture of vegetable oil and beeswax is a traditional ratio used for patch and bullet lubricant, as well as gun grease for black powder revolvers, going back to the Mexican War. You should never use vegetable oil on butchers block, cutting boards, counters, etc; especially racid oil. Rancid means it’s decomposing, ie “rotting”. And I’m not sure I would want to use rancid oil on leather I wore or used in hand. Your link for the soapmaking book is invalid. Next time, include the title so even if the link goes bad the reader can search for it. You should NOT use rancid oil in soap. It will smell rancid, at least in the after smell (after rinse). Mix with sand and stick your gardening tools such as trowels in the sand to keep them rust free. Oil works great to remove other oils and sticky things from skin, surfaces, etc. I just wouldn’t use rancid oil on my skin. Pets should not eat rancid oils either. Rancid oils should not be used on our skin or anything that touches our skin. We use vegetable oil for bar oil in the chainsaw. Rancid might work just fine. Bar oil tends to spray all over the place so now we have less fossil fuel on our land. What about a body oil? Or is it bad for that too? I haven’t thought of that, but I don’t think it would be a good idea. When oil becomes oxidized, it becomes rancid, and the process produces free radicals, which are bad for the human body, both inside and out. Now, I read on a soapmaking blog that you could use rancid oils to make 100% saponified soaps and simply add some pleasant scent to the soaps. I gotta wonder about this. Would the rancid smell still potentially be an issue that may just be being masked? I know that I would worry about this with any type of polishing or shining I’d otherwise consider — and with the oil lamps as well, to be honest. Might rancid oil soaps possibly not be the best choice for hand washing, due to possible pathogens from the “rancid” factor, or are all potential pathogens killed by the soapmaking process? I don’t know. I also wonder how the fat / oil content in homemade soaps compare to store-bought: is one easier on wastewater pipes than the other? For example, does one contain more grease that might cause clogging when used long-term, or is the grease / oil in the soaps not a major issue in general? I don’t make soaps and am not a chemist / biochemist / microbiologist, so I don’t know. Oh yeah, almost forgot: I believe that rancid oils also aren’t the best for biodiesel, either, due to the fact that the oils are already decomposing. Unless I’m mistaken, if the oil would be a safe and healthy oil for you to cook with — i.e., fresh and vegetable-based — then it’s probably a good candidate oil for biodiesel. But, I would check with actual biodiesel researchers, in case I’m wrong.